Tigers can reach a length of up to 3.3 metres (11 feet) and weigh as much as 300 kilograms (660 pounds). Subspecies of the tiger include the Sumatran Tiger, Siberian Tiger, Bengal Tiger, South China Tiger, Malayan Tiger and Indochinese Tiger. Many subspecies of the tiger are either endangered or already extinct. Humans are the primary cause of this through hunting and the destruction of habitats. Around half of tiger cubs don’t live beyond two years of age. Tigers are good swimmers and can swim up to 6 kilometres. Tigers are loners except when they mate or raise offspring. Their territories can overlap those of female tigers. They spray urine and gland secretions to demarcate their territories on bushes or trees. The largest animals are the Siberian subspecies which weigh around 225 kg. Females are smaller than males. A tiger’s night vision is six times more powerful than that of humans. They have round pupils with yellow irises that blaze back ambient light at night. The life span of a tiger in the wild is about 10 – 15 years and roughly 26 years when held in captivity. Their muscles enable them to leap 10 yards or jump 1.5 m in the air to catch their prey. Tigers are agile and capable of moving stealthily and silently. A tiger’s teeth are10 times bigger than our largest tooth. The Canines are fully developed within 16 months. They start making their kills when they are about 18 months. These animals eat about100 lbs of meat at a time and can swim and dive underwater. In addition to their wild prey, tigers will also eat monkeys, fowls, frogs, tortoises, porcupines and deer. The gestation period is about 103 days and the females can give birth to up to 7 cubs at a time. A tiger has about 100 stripes and the pattern of stripes on one tiger is quite unique from any other. Tigers usually hunt alone at night time. Tigers have been known to reach speeds up to 65 kph (40 mph). Tigers can easily jump over 5 metres in length. 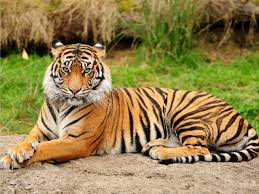 Various tiger subspecies are the national animals of Bangladesh, India, North Korea, South Korea and Malaysia. There are more tigers held privately as pets than there are in the wild. Tigers that breed with lions give birth to hybrids known as tigons and ligers.